A Boston City council meeting on Wednesday afternoon about the Boston Freedom Rally grew contentious. 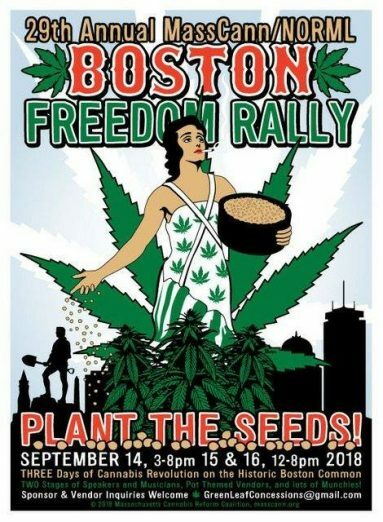 Critics of the Boston Freedom Rally, often referred to as Hempfest, said the rally left large amounts of trash on the Boston Common during the rally in September along with other violations of their permit. Nearby neighbors complained about the noise. Massachusetts Cannabis Reform Coalition (MassCann), organizers on the rally, said they take residents’ concerns seriously. “Everything that has been brought up, we are willing to work on,” said MassCann President Bill Flynn. However, group Friends of the Public Garden, said they have had enough of the rally. The group complained about people camping out on the Common all weekend in tents and needles being found. “The organizers can’t manage it anymore,” said executive director of the Friends of the Public Garden Elizabeth Vizza. City Councilor Ed Flynn said he didn’t want to end the rally but also wanted to make sure the Common remained clean. He suggested the rally be held at City Hall Plaza instead. John Swomley, an attorney representing MassCann, said the city has a history of trying to end the rally, which impedes on freedom of speech. MassCann has sued the city six times in the past and won every time. Swomley said MassCann has every right to use the Common for the rally. “It is insulting to your father’s name,” he said to councilor Josh Zakim. “If you want a fight, you’re going to get one. Shut your mouth,” Zakim retorted. Councilors pondered the possibly of turning the three-day event into two days instead. Organizers of the rally said they were open to that idea. They also said they are working on creating better trash guidelines for attendees. Make them post a bond. If there is a clean-up afterward, taxpayers don’t foot the bill. If they want to fight the bond, then I guess they are pretty aware of the issue. Have Zakim put his money where is mouth is.